Craft designer Marie Browning has a knack for inventing wonderful books. 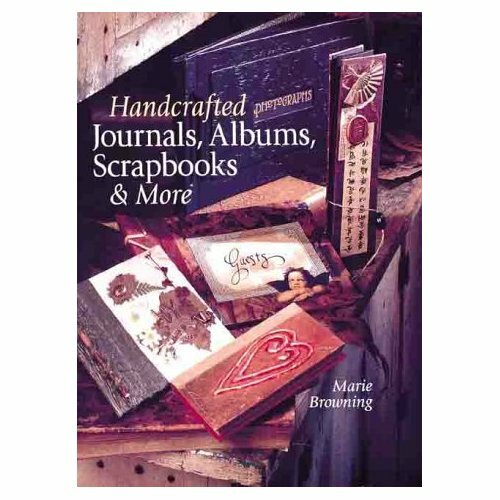 Her exquisite creations are shown to great advantage in Handcrafted Journals, Albums, Scrapbooks & More in excellent photographs, and are well explained in step-by-step directions. Folded books, envelope books, and simple bound books come alive with decorative papers (for which she also provides instructions), textural covers, artfully threaded bindings, and lovely embellishments like metal charms, pressed flowers, clip-art labels, ribbons, embossed stamps, and more. Most projects are fairly easy, requiring more patience and time than advanced crafting skill.